A method of forming an improved hydrophilic coating by applying a non-reactive hydrophilic polymer surface layer with an osmolality in­creasing compound to produce a more stable hydrophilic surface and to produce a more slippery surface in wet condition. The polymer surface layer is treated with a solution having above 2% (weight to volume) of an osmolality increasing compound and then the solvent of the solution is evaporated. Osmolality increasing compounds are nontoxic organic or unorganic salts other then trihalogenids, mono- or di­saccharides or sugar alcohols. Preferred compounds are glucose, sorbitol, sodium chloride, sodium citrate, sodium bensoate, calcium chloride, potassium chloride, potassium iodide, potassium nitrate. The solution of the osmolality increasing compound contains preferably a polymer. Medical articles treated with the solution of osmolality in­creasing compounds according to the method above also relate to the invention. This invention relates to a method of coating a hydrophilic polymer surface layer with an osmolatity increasing compound to produce a more stable hydrophilic surface as well as medical articles being coated with said improved hydrophilic coating. A hydrophilic coating having a much lower coefficient of friction in wet condition than in dry condition. Thus, the formation of hydrophilic coating on substrates has many applications but in particular is most desirable in many biomedical applications. For example, biomedical applications such as wound drains, catheters, surgical tools and other medical instruments intended to be entered in the body cavities, because the instrument gives a good hand grip in dry condition while simultane­ously becoming very slippery when it gets in contact with water-based liquids, and thus can be inserted easily without causing trouble to the patient. Further, an article having a hydrophilic surface coating is desirable to minimize thrombosis, crystal formation, tissue trauma, tissue adhesion to medical instruments, and foreign body reactions. In prior art methods, surfaces have been rendered hydrophilic by such methods as high energy radiation in situ polymerization processes, by grafting, by forming interpolymer network or by direct chemical bonding, for instances by isocyanates or silanes. Such hydrophilic polymer surfaces for medical use are described for instance in GB 1 600 963, US 4 373 009, US 4 459 317, WO 83/03977 and European Patent Application 83850090.8. Extensive studies indicate, however, that the hydrophilic coating can be dried out, thus rendering the article insufficiently hydrophilic. The object of the present invention is to prepare an improved hydro­philic coating on an already hydrophilic polymer surface layer on a substrate. This object of the invention has surprisingly been achieved by applying a solution of an osmolality increasing compound to a non-­reactive hydrophilic polymer surface layer and then evaporating the solvent of the solution. While experimenting with hydrophilic polymer coatings on various sub­strates the applicant found that when an article coated with a hydro­philic polymer surface layer is dipped in water it will be well wetted but there is a great risk that the polymer surface lose its water when it comes in contact with a mucous membrane or suchlike. This depends on the difference in the osmotic potential between the hydrophilic surface and the mucous membrane. The mucous membrane has a higher osmotic potential that is a higher salt concentration than the hydro­philic surface, which results in that the water goes from the hydro­philic surface layer to the mucous membrane so that the difference in the salt concentration will be counterbalanced. According to the invention it has surprisingly been found possible to further reduce the low friction of the hydrophilic surface and to enhance the osmolality of the hydrophilic surface simultaneously by applying a coating of an osmolality increasing compound to the hydro­philic polymer surface layer. Different types of osmolality increasing compounds can be used such as inorganic or organic salts, mono- or disaccharides or sugar alcohols. Examples of such osmolality increasing compounds are glucose, sorbitol, sodium chloride, sodium citrate, sodium bensoate, calcium chloride, potassium chloride, potassium iodide, potassium nitrate. This osmolality increasing compound must be non-­toxic. The process has found to be especially useful for sodium chloride. The osmolality increasing compound may be mixed with a polymer and dissolved in water or a lower alcohol, preferably in water to a suitable viscosity. Said solution is applied to the hydrophilic polymer surface layer by dipping, spraying or the like and then the solvent is evaporated by air drying or by drying at elevated temperature. The added polymer ought to be well compatible with the polymer in the polymer surface layer, preferably the same polymer. The polymer is not a necessary additive to the solution but it enhances the viscosity and by that the reception of the osmolality increasing compound can be controlled. Further, the polymer possesses a lubricating property and a controlled release effect. The process according to the invention can be used for coating many different types of well-known hydrophilic polymer surfaces, wherein the hydrophilic polymer is selected from polyvinyl compounds, polysaccha­rides, polyurethanes, polyacrylates or copolymers of vinyl compounds and acrylates or anhydrides. Especially polyethyleneoxide, polyvinyl­pyrrolidone, heparin, dextran, xantan, polyvinyl alcohol, hydroxy propyl cellulose, methyl cellulose, copolymer of vinylpyrrolidone and hydroxy ethylmethyl acrylate or copolymer of polymethylvinyl ether and maleinic acid anhydride. The preferred hydrophilic polymer is polyvinyl pyrro­lidone. The polymer surface layer must be made non-reactive for instance by curing. The substrates may be any polymer material, which are well-known to use and to which the said hydrophilic polymers adhere, such as poly­urethanes, latex rubbers, other rubbers, polyvinylchloride, other vinyl polymers, polyesthers and polyacrylates. The hydrophilic surface contains an appreciable amount of partly freely movable polymer chains. Thus it has been shown that some coating can complex-bind a substantial amount of elemental iodine, which is for example the case with free polyvinylpyrrolidone and iodine when a hydro­philic surface of polyvinylpyrrolidone is treated with a KI/I₂ solution. 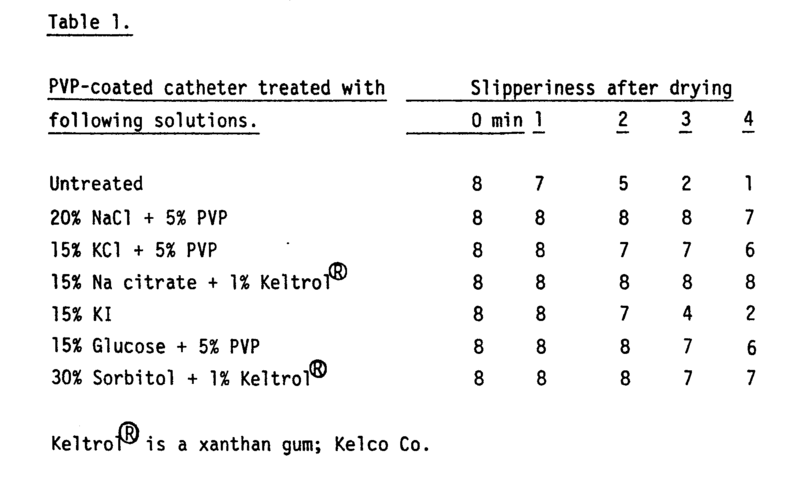 PVP-coated catheters treated with a KI/I₂ solution have a less slippery surface than corresponding untreated surface and such KI₃-treated catheters dry more quickly. Example. A trimerized hexamethylene diisocyanate of biuret type (named Desmodur L 2291; Bayer AG) was dissolved in methylene chloride to a concentration of 6% (weight/volume). A urinary PVC catheter was dipped in this solution during 30 seconds. The catheter was then dried at 70°C during 60 seconds, whereupon it was dipped during 5 seconds in a solution containing 33 g polyvinylpyrrolidone (K25; mean molecular weight 25 000) per 100 ml methylene chloride. This solution also con­tained 0.33 g triethylene diamine (DABCO®) per 100 ml solution. The catheter was then allowed to dry at ambient temperature during 60 seconds, then cured during 40 minutes at 70°C, cooled to ambient tempera­ture and was then rinsed in water. Such a catheter was dipped in a solution containing 20% (weight/volume) sodium chloride and 5% polyvinyl­pyrrolidone (PVP) (weight/volume) dissolved in water during 1 hour at 20°C. The catheter was then allowed to dry at 70°C during eight hours. The catheter has a very slippery and adherent surface when wet. A number of catheters according to the examples were dipped in different solutions comprising osmolality increasing compounds during 10 minutes and were then placed in water during 30 seconds at 23°C and a relative humidity of 49% and then dried at room temperature. The slipperiness was noticed 1 min., 2 min. etc. after already begun drying. The value of slipperiness was noticed in a relative scale, wherein 8 means a very slippery surface and 0 means a dry surface. This experiment was repeated with a number of corresponding PVP-coated catheters but without the coating of osmolality increasing compound. The table 1 shows that the catheters having a coating of a non-toxic, osmolality increasing compound retain their slipperiness for a longer time than the corresponding untreated surfaces i.e. the coated catheters dry more slowly. The osmolality increasing compounds prevent the hydroph­ilic polymer surface to desiccate. Thus, catheters applied with an osmolality increasing compound such as sodium chloride according to the invention dry more slowly than corresponding untreated catheters. The sodium chloride treated catheter keeps its slipperiness a much longer time period, which is very desir­able. Medical tests show that the catheters applied with a coating of a osmolality increasing compounds such as sodium chloride are superior both at the insertion and at the removal of the catheter in urethrea. 1. A method of forming on a non-reactive hydrophilic polymer surface layer bound to a substrate an improved hydrophilic coating which has a very low coefficient of friction when wetted with a water-based liquid characterized in treating said polymer surface layer with a solution having above 2% (weight to volume) of a non-toxic organic or unorganic salt other than a trihalogenide such as KI₃ (KI/I₂), a mono- or di­saccharide or a sugar alcohol and then evaporating the solvent of the solution. 2. A method according to claim 1 in which the compound in the solution is selected from the group consisting of glucose, sorbitol, sodium chloride, sodium citrate, sodium bensoate, calcium chloride, potassium chloride, potassium iodide or potassium nitrate. 3. A method according to claim 1 in which the compound of the solution is selected from the group consisting of glucose, sodium chloride, sodium citrate, sodium bensoate, calcium chloride, potassium chloride, potassium iodide or potassium nitrate. 4. A method according to claim 1 in which the solution contains a polymer, preferably the same polymer as in the polymer surface layer. 5. A method according to claim 1-4 in which the solution having about 4% to about 40% (weight to volume) of sodium chloride. 6. A method according to claim 1 in which the polymer surface layer is cured. 7. A method according to claim 1 in which the polymer surface layer to be coated comprises a polymer selected from the group consisting of polyethyleneoxide, polyvinyl pyrrolidone, polyvinyl compounds, poly­saccharides, polyurethanes, polyacrylates or copolymers thereof. 8. A method according to claim 1 in which the polymer surface layer comprising of polyvinyl pyrrolidone and in treating with a solution having 20% (weight/volume) of sodium chloride. 9. A medical article having a very low coefficient of friction when wetted with a water-based liquid which comprises: a substrate, a non-reactive hydrophilic polymer layer on said substrate, and an eva­porated coating of a non-toxic organic or unorganic salt other than a trihalogenide such as KI₃ (KI/I₂), a mono- or disaccharide or a sugar alcohol on the thus hydrophilic polymer layer. 10. A medical article according to claim 9, in which the evaporated coating consists of glucose, sorbitol, sodium chloride, sodium citrate, sodium bensoate, calcium chloride, potassium chloride, potassium iodide, or potassium nitrate. 11. A medical article according to claim 9, in which the evaporated coating consists of glucose, sodium chloride, sodium citrate, sodium bensoate, calcium chloride, potassium chloride, potassium iodide or potassium nitrate. 12. A medical article according to claim 8 characterized in that it comprises a catheter. 13. A medical article according to claim 12 which is a urinary catheter. AT86850317T AT70075T (en) 1985-09-30 1986-09-19 A process for producing a hydro-filament coating on a polymeric surface. Owner name: ASTRA TECH AKTIEBOLAG TE MOELNDAL, ZWEDEN.